Since he first started exhibiting his works five years ago, Matthew Brandt has made a major impact on the avant-garde photography scene interested in redrawing the boundaries of traditional photography. Although digital photography seems to have made analog obsolete, artists like Brandt continue to make works that are photographic objects, using both old and new technologies, crisscrossing boundaries and blending techniques. 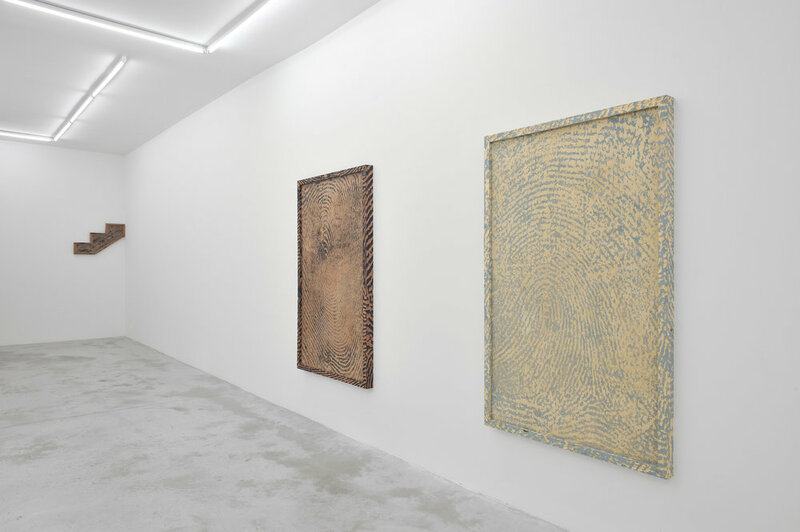 Investigating physicality and process, his work is the clever manifestation of a photographic alchemist. 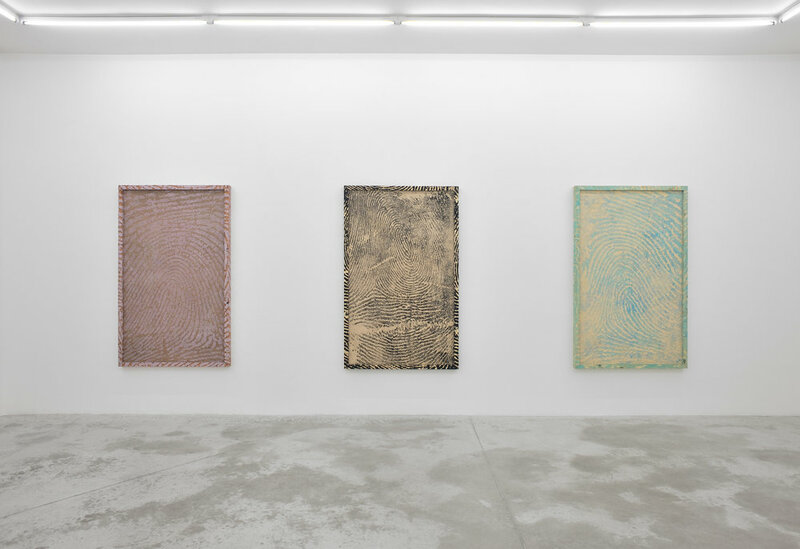 Brandt transmutes photography through unconventional materials, and centers his conceptual body of work on archaic photographic processes. Often Matthew Brandt creates his prints using physical elements from the subject itself. 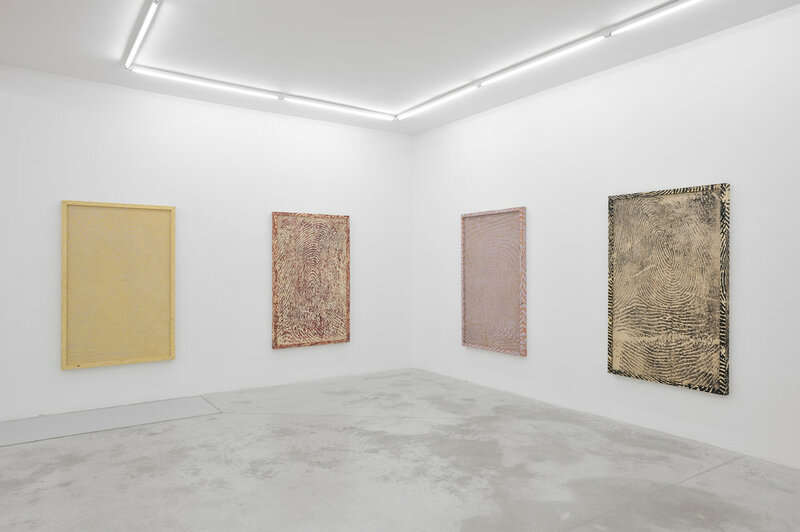 Previous series have included architectural photographs of destroyed historical sites using dust from the depicted sites as pigment for their prints, portraits of friends and family using various bodily fluids as chemical content to produce their own image, landscape photographs printed with various food condiments, or landscape photographs that are soaked in the specific lake or reservoir water that they represent. With three series all playing around woodblock printing techniques, this new exhibition is an extension of Brandt’s ongoing efforts in exploring historical image making techniques. 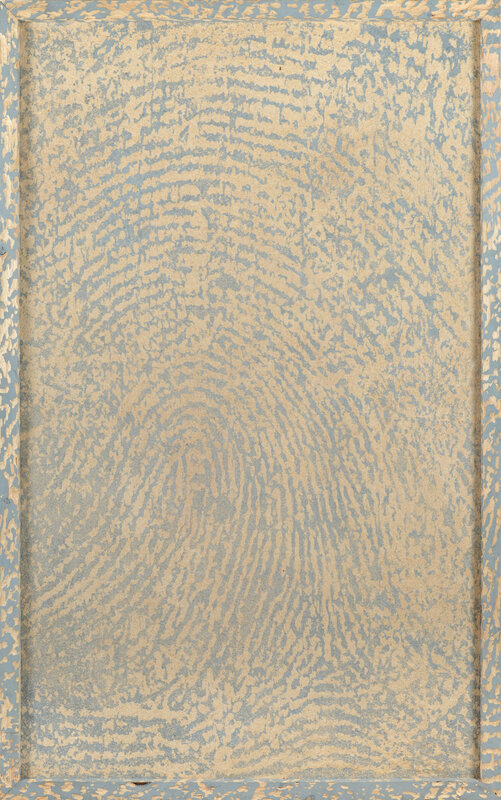 The nature of woodblock printing being a process of cutting, leaving impressions and printing what remains, led Brandt to think about those who left impressions on him, resulting in a series of works representing the fingerprints of influential artists like John Baldessari, Morgan Fisher, Robert Polidori, Jim Shaw, Marnie Weber or James Welling. 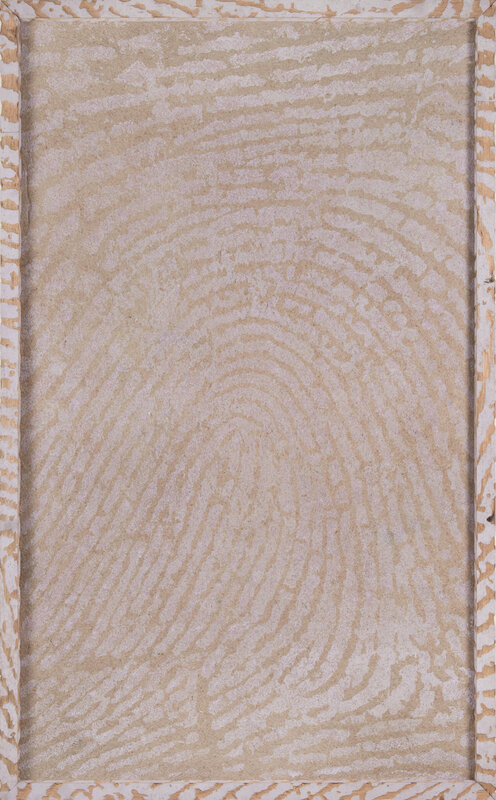 Their fingerprint lines were enlarged and hand carved onto the grain of wood panels of local California cedar, redwood, pine, spruce and fir. 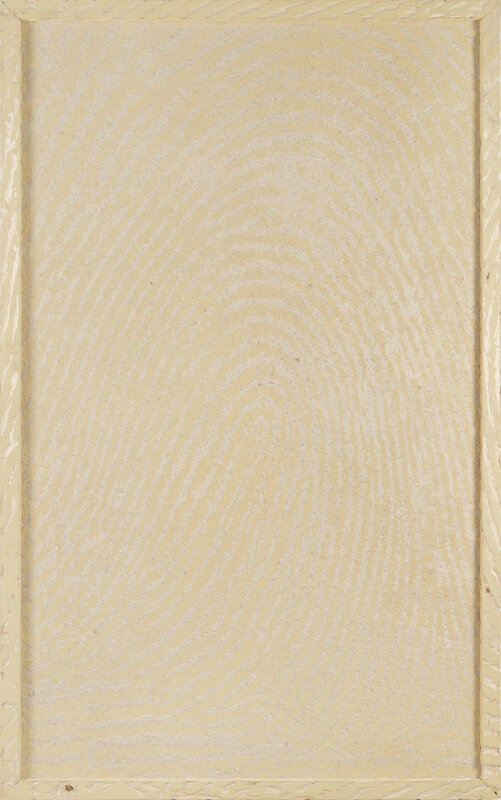 After being carved, these wooden fingerprints are then applied with natural inks made from insects, plants, or minerals. They are then printed onto sheets of paper that were handmade from the same wood. After one print is made, the woodblock is cut up and used to build a frame for the print. 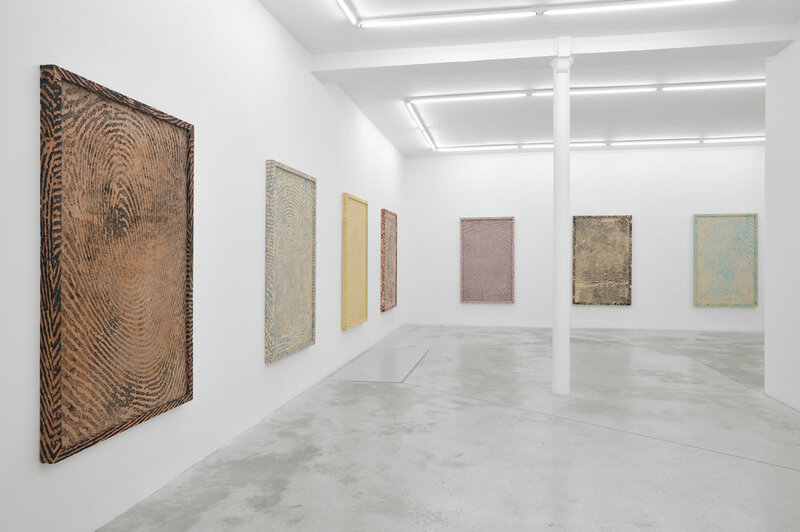 Another series is even more exemplary of the reflective nature of the artist’s practice as it explores the physical imaging qualities of wood itself. The material of wood is used for making paper, processing the print and shaping the image that simply shows the grain of the given piece of wood. 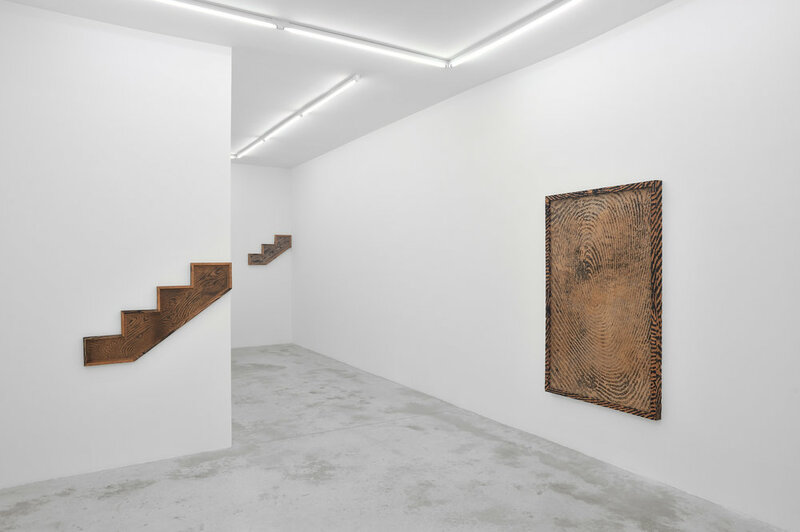 The prints are then framed in shapes of steps using wooden construction material directly bought from the hardware store, but first of all relating to the architecture of Praz-Delavallade gallery. 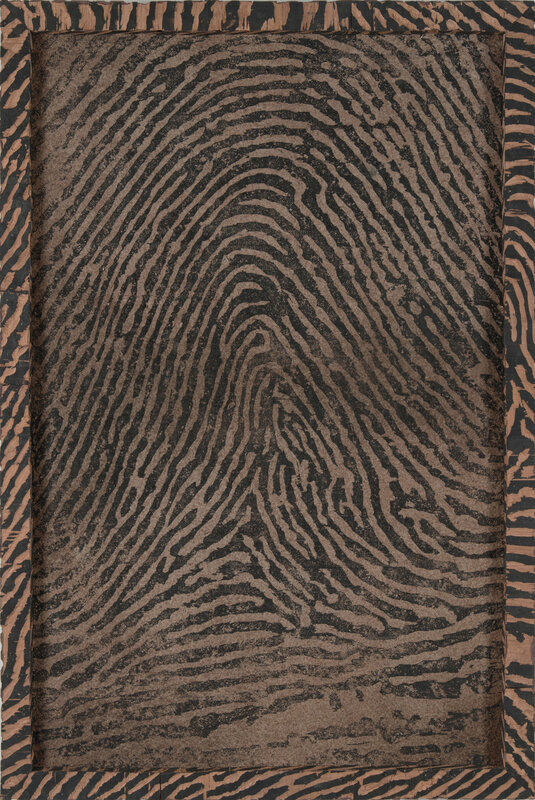 In relation to the finger prints of the artists, they also can be read as a reflection on ones own artistic progress.